The Social Democratic Party in Russia supported the ideas of Karl Marx. 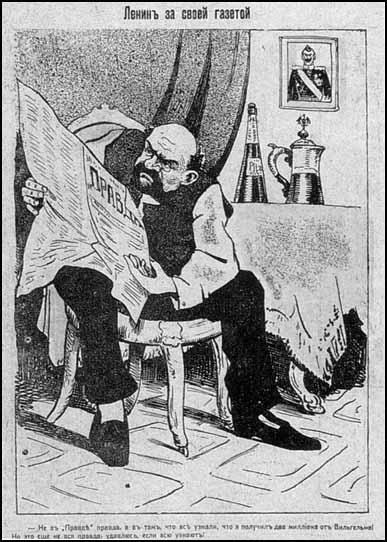 In 1903, radical members left the party to form a group called the Bolsheviks. The leader of this group, Lenin, was in neutral Switzerland during the First World War. 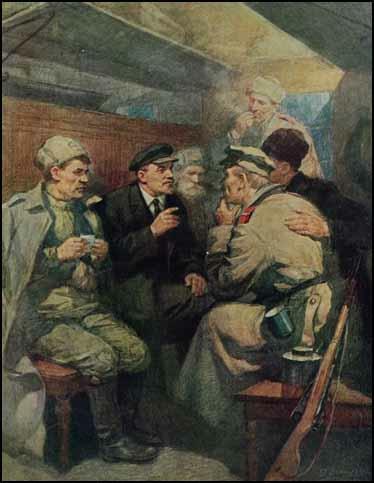 After the overthrow of Tsar Nicholas II, Lenin arranged to travel back to Petrograd in a special sealed train. 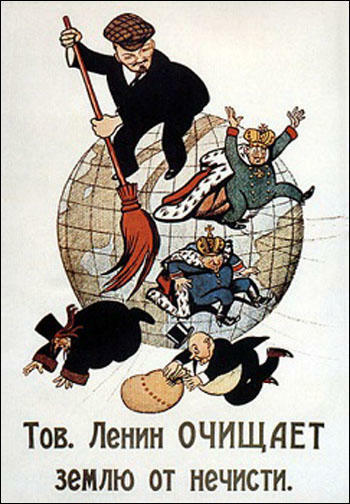 Within days of arriving in Russia, Lenin had published his April Theses which stated that the Bolshevik party should work for the overthrow of the Provisional Government. At this stage there were only about 50,000 Bolsheviks in Russia and most of these lived in two places, Petrograd and Moscow. However, their policies of land redistribution and peace negotiations proved popular and by the summer of 1917, membership had risen to about 240,000. The addressing of the officers with the titles "Your Excellency", "Your Honour," and the like, is abolished and these titles are replaced by the address of "Mr General," "Mr Colonel," and so forth. The Bolshevik speaker would ask the crowd "Do you need more land?" (Yes of course we do...) "Do you have as much land as the landlords do?" (No, they have much more than we have). "You see! But will the Kerensky government give-you land? No never. It protects the interests of the landlords. Only our party, the Bolsheviks, will immediately give you land"... Several times I tried to take the floor and to explain that the Bolsheviks make promises which they can never fulfil. I used figures from agrarian statistics to prove my point; but I saw that the crowded square was unsuitable for academic discussion, and especially for statistics. The Central Committee recognizes that the international position of the Russian revolution... as well as the military situation (the indubitable decision of the Russian bourgeoisie and Kerensky and Co. to surrender Petrograd to the Germans), and the fact that the proletarian party has gained a majority in the Soviets - all this, taken in conjunction with the peasant revolt and the swing of the popular confidence towards our Party (the elections in Moscow), and, finally, the obvious preparations being made for a second Kornilov affair (the withdrawal of troops from Petrograd, the dispatch of Cossacks to Petrograd, the surrounding of Minsk by Cossack, etc.) - all this places the armed uprising on the order of the day. Question 1: (a) Use the sources in this unit to explain the meaning of source 1. (b) Compare the impressions given of Lenin in sources 1 and 5. Question 2: Study sources 2, 3, 4 and 6 to explain why the German Government helped the exiled Bolsheviks to go back to Russia in 1917. Question 3: Interpret source 8 from the point of view of: (a) an observer sympathetic to Lenin; (b) an observer hostile to Lenin. Question 4: Explain why Sergei Pushkarev meant by the phrase "I used figures from agrarian statistics to prove my points, but I saw that the crowded square was unsuitable for academic discussions". Question 5: Study source 10 and then give three reasons why the Bolsheviks believed that the time was right to overthrow the Provisional Government.